The course will begin with a review of the South Carolina Code of Laws. This will prepare students for researching sections of the Code through the rest of the course. The section on offers and counteroffers describes the key principles of both, and reviews the duties of a licensee during this process. We will then examine the potential pitfalls of mishandling offers and counteroffers to ensure that students can recognize these mistakes. After offers, we will learn the four basic elements of a legal contract, and discuss how different variables can change the validity of a contract. We will also look at the Statute of Frauds to see how history has molded the real estate industry. In the section on customers and clients, students will learn the differences in obligation when working with clients versus customers. This will keep licensees from overstepping boundaries of confidentiality. In types of agency, students will explore the different avenues of agency available in South Carolina and determine when each type should be utilized. The discussion on the Disclosure of Brokerage Relationships form will include looking at the form and explaining each section. Students must have proficient knowledge of the form so that they can explain it to consumers clearly and concisely. The section on transaction brokerage gives a full description of this new type of non-agency. 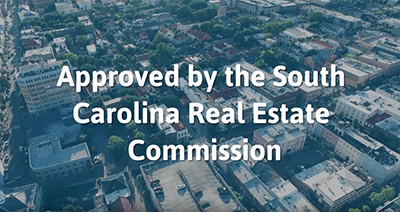 Since it is a newly implemented tool in South Carolina, we will spend extra time looking at all aspects of transaction brokerage so that students feel comfortable performing the tasks expected of a transaction broker. Finally, we will describe the regulations surrounding the operation of real estate teams. There are many ways to violate the regulations on teams, and students must be careful to adhere strictly to the Code. This course does not have a final exam. Instead, there are four incremental exams between sections of content. This is done so that the information is still fresh when students are quizzed on what they have learned. Each exam asks 10 questions. There are also various exercises for students to be more involved in the course. These exercises are placed between sections of content, and around the incremental exams. Students will not be quizzed on what they learned in the exercises, just in the regular content.